The Ghost Train (1941) is a quaint reminiscence of Agatha Christie’s plays - assembling a cast of strangers in a murder-mystery location (here a spooky British village railway station) and then allowing tension and suspicion to heat up under them till the truth comes out. It was based on a play of the same name by Arnold Ridley best known as Private Godfrey in that most enduring of British war TV sitcoms Dad’s Army. Ironically, his famous role as a dithering conscientious objector was the opposite of his real-life service heroism in both World Wars, sustaining shell-shock in the harrowing trench warfare of the Somme and returning to France in 1939 as a Major in the British Expeditionary Forces. Ridley wrote the play whilst struggling as an actor between the wars in 1923, inspired by an evening he spent stranded at a train station in Macclesfield where the sound of trains on a nearby line gave him supernatural ideas. He blended a ghost story with espionage intrigue and suddenly found himself a celebrated and rich West End playwright as a result. However, he later lost all his money in a bad film investment and according to his son Nicolas in a 2010 Daily Mail online article: “He made the final mistake of selling the amateur rights of The Ghost Train for £200”, which otherwise would have netted him huge earnings from the countless am-dram productions since. By the time director Walter Forde shot The Ghost Train in 1941 for British studio Gainsborough Pictures, there were already three versions preceding it: a 1927 German-British version a (currently lost) 1931 remake and one filmed in 1937. The play was retooled for war-time audiences - its original Soviet arms smugglers behind the ghost plot were now modernised to fit topical paranoia about treacherous fifth columnists gun-running for the Nazis. It still plays as something of a time-capsule adding war-time pragmatism yet harking back to subtle pre-war class distinctions in the enforced intimacy of the players thrown together for the night. The screenplay re-vamping was done by J.O.C. Orton along with dialogue by Marriott Edgar who went on to write films for this chapter’s stable-mate Will Hay, and Val Guest (well-known to horror fans as later director of the first two Quatermass films and The Abominable Snowman for Hammer). Script-tweaking was done to provide a vehicle for the much-loved comedy team of Arthur Askey (1900-1982) and Richard ‘Stinker’ Murdoch (1907-1990). Askey was born in Liverpool and after learning the variety skills of British music hall he developed his act in shows during his army service in World War One. Years spent on the concert party circuit led to his famous BBC radio series Band Waggon from 1938 to 1940 partnering him with Murdoch who acquired the nickname ‘stinker’ as a parody of his upper-crust public school and Cambridge education. The show was an anarchic smash hit for the pair, and listeners’ enjoyment of their contrasting voices was augmented when audiences saw them in the flesh for the live London Palladium show and the film released a few weeks before The Ghost Train. Murdoch had a privileged leading man’s tall, clean-cut physique opposite Askey’s diminutive, plain but effervescent cheeky chappy, an irrepressible schoolboy wit in Harold Lloyd round-rimmed spectacles. Ridley’s spooky play benefits from the twosome straight away. By pulling the communication cord on their train to retrieve his hat from the track – “I lost me titfer!”- Askey establishes himself as an insouciant rule-breaker. The duo meet and good-naturedly duel over Carol Lynne’s comely Joyce Winthrop in her compartment, totally ignoring the chagrin of Richard (Peter Murray-Hill) a posh professional cricketer who may or may not be her protective brother. Askey pulls a marvellous lip-pursing fish impression against the glass to infuriate him and sets about winding Murdoch up into similar snobbish condescension: “I wasn’t talking to you, little man”. 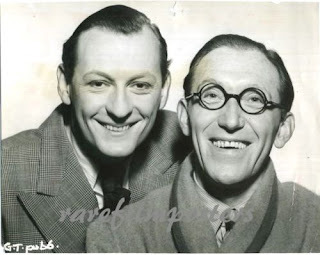 Askey’s part was rewritten as touring variety comedian Tommy Gander (a clear nod to his famous friend Tommy Trinder who’d appeared with Askey and Murdoch in the Palladium show), a perfect showcase for his endlessly chattering repartee and one-liners. He made sure his catch-phrases ‘Hello playmates’ and the immortal ‘Ay thang yew’ were in evidence throughout as well. When the wider group of passengers are stranded overnight at the fog-bound Fal Vale station instead of their Truro destination, it is he who valiantly tries to keep their spirits up and dispel stories of the one that supposedly haunts the location. The rest of the forced ensemble are made up of a brow-beaten young couple Edna (Betty Jardine) and her soon-to-be husband and gormless drip Herbert (Stuart Latham), the strictly teetotal cockney sparrow Miss Bourne (Kathleen Harrison) complete with parrot straight out of a music hall ditty and a mild-mannered G.P. Dr Sterling played by Morland Graham. 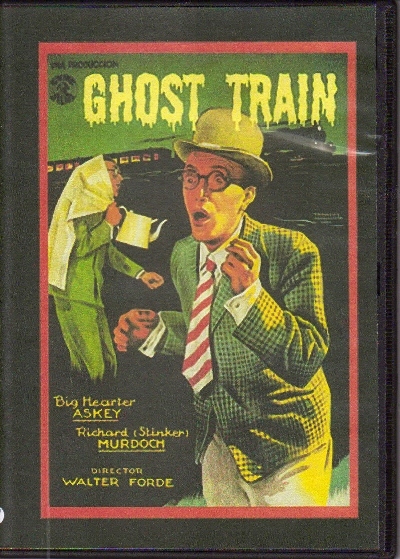 They are treated to the gruff non-compliance of the Station Master Saul Hodgkin (Herbert Lomas) who has no choice but to let them wait overnight for a morning train but warns them of the legend of the ghost train that crashed due to a Station Master taken ill just as the bridge needed opening. The hideous tragedy that followed has been marked ever since by a spectral train that no living person should ever witness on pain of sudden death. For the first half, the group battle on with the business of making tea and trying to get comfortable while Gander entertains them with fate-tempting mockery of the ghost and bad puns: “Why should I catch oldmonia? I’ve had pneumonia”. Then events take a more sinister turn when Hodgkin returns to collapse dead into the waiting room. “Young man, you forget yourself”. “Young woman, you flatter yourself”. Two more involuntary guests appear. One is the literally haunted beauty Julia Price (Linden Travers) emotionally scarred into former sanatorium convalescence by an obsession with the ghost myth, In tow is her frosty brother John (Raymond Huntley). In real-life Huntley became somewhat preoccupied with the ghoulish figure of Dracula as he reputedly played the stage role more times than anyone else - from London’s West End to tours of the USA between 1927 and 1930. Only by turning down the Broadway run did he make room for what became a star-making replacement for one Bela Lugosi. Julia’s appearance is a magnifying glass for a well-handled scene of claustrophobic tension as she believes she can hear the ghost train approaching. The apparition is merely suggested by off-screen sound effects and lighting but creates an intense expectation as it finally roars past. She tears herself way from safety and by smashing a window witnesses the ectoplasmic choo-choo which overcomes her senses in horror. The release of post-phantom pressure seems to relax everyone’s inhibitions a little further. 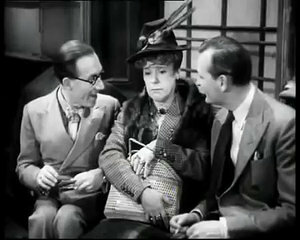 Askey mischievously skirts the blue-pencil boys with his reference to an Auntie’s flatulence: “Her doors were always blowing open” and even the funereal Herbert lights up his libido at the thought that Edna and he will have to spend a night together without her nightdress: “That’s right” he grins for the first time. After a second sequence of the tastefully macabre, a wide shot showing Ben Isaacs, apparition of one of the victims, singing ‘Rock of Ages’ as he exits the tunnel, the criminal element is revealed with a judicious bit of gun-play and amateur sleuthing and Blighty is rendered safe once more for the decent little Englander. The Ghost Train is a restrained, mostly gentle piece of comic spookiness at a time when British audiences were still being protected - from too much horror as a result of strict film censoring dating back to 1934 as well as of course the stark realities of war-time fears. 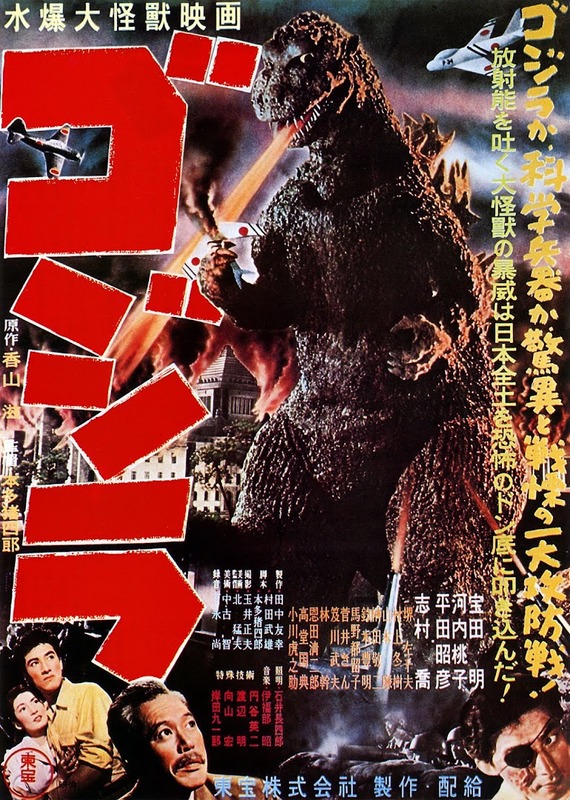 One of its pluses is the way the plot’s siege situation works as a metaphor for the plucky Blitz spirit of WWII, the conflict and rubbing along together across social boundaries in the face of imminent danger. Allowing rich possibilities for character byplay amongst the ensemble, it’s easy to see also why the play is so popular with amateur companies. Although Arnold Ridley missed out on those rewards, he had the comfort of a flickering cathode-ray after-life in the perennial Dad’s Army.